It’s easy to imagine. . . maybe you’ve seen it first-hand. Processes such as packaging, manufacturing, producing dry foods, and others, can leave production plants MESSY! Whether dust from corrugate boxes or cardboard, shavings from machining operations, powdery food or spices, often times particles from these processes become airborne only to later fall into every little nook and cranny possible, which can eventually be damaging to equipment. We understand this is a real problem for many packagers and manufacturers so we came up with a solution. One of our latest conveyor innovations is our new product line, DustPruf conveyors, which provide all the integration and flexibility of conveyors with a T-slot; without their inherent drawback – slots that collect dust and product debris. Particulate build-up can be detrimental to a conveyor’s performance, which ultimately decreases your overall productivity. This is why DustPruf conveyors are designed with SmartSlot technology, which make the side frames flat and smooth and eliminates those catch points for dust. The patent pending SmartSlot system is designed into the frame of a DustPruf conveyor. This innovative, do-it-yourself technology allows you to attach any automation accessory, guiding, or other components with self-tapping screws and a cordless drill. The SmartSlot’s location is indicated by a small, smooth indent on the conveyor’s frame to ensure accuracy and confidence when attaching additional components. Our small parts handling, DustPruf 2300 Series has one SmartSlot on each side, while our flexible plastic chain DustPruf 5300 Series has two SmartSlots on each side. SmartSlots make DustPruf conveyors ideal for environments where particulates, dust, or product debris can collect. 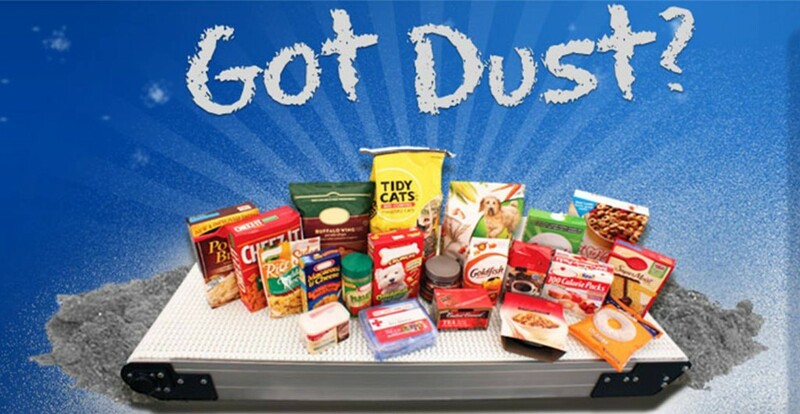 Applications in bakery, confectionery, pet food, clean room, pharmaceutical, medical devices, personal care products, and all other packaging areas where corrugate dust is present will benefit from this technology.